Hello, we're glad you found us... if you had the ability to have the life you want, the job you want or the relationships you want would you say yes? If you think it's not possible or you don't believe you can achieve this, then we need to change your thinking. Never done life coaching before and would like to find out more...? Well, we are please to offer coaching awareness session (limited places). Please book on our Event Bright page. At Just Smart Thinking we understand that life can be challenging with many highs and lows. We believe that through Life or Leadership Coaching you will find the clarity you need to make the changes that will bring you focus, contentment and happiness. Through our Life Coaching partnership we will help you find the passions and drive for change and with your commitment to take action we guarantee that things will change. 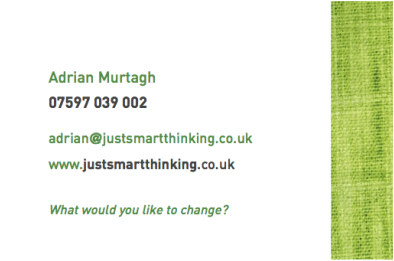 ​Just Smart Thinking has been created to bring you the principles of Life and Leadership Coaching through our innovative 'Catching Ideas with you/leaders' sessions. Our approach to Life and Leadership Coaching is simple; it's conversations and questions to help catch your ideas to clarify certain aspects of your personal and working life. We know that you have all the answers; you just haven't been asking yourself the right questions... yet! "If you want us to help you catch your ideas and get more clarity in your decision making; don't hesitate to email or call us, we look forward to hearing from yo﻿u." What is the one thing you would like to change? Please share your details and let's get started.